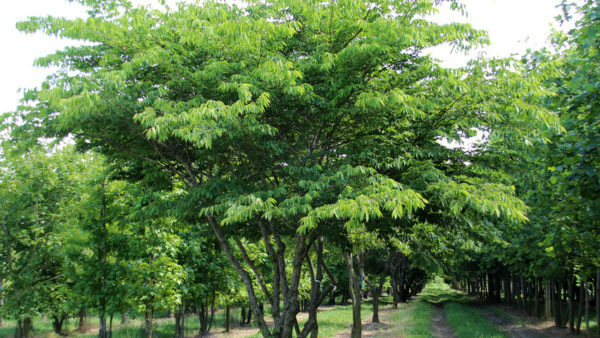 Zelkova serrata is a medium sized tree with upright stems it forms a broad habit and rounded crown, the perfect specimen tree grown in this multi-stem form. This native of Japan, Taiwan and east China is a member of the Elm family and because of its high resistance to Dutch elm disease it is often promoted as a substitute. Relatively fast growing when young it will tolerate nearly all soils, but does best in a moist, well drained location. Insignificant flowers appear in spring as the foliage begins to emerge, these flowers become small wingless drupes which mature in autumn. The oblong-ovate leaves have a serrated margin and are green through spring and summer then turning orange-red in autumn. Another attractive feature is the smooth grey bark which starts to flake in maturity to reveal beautiful orange patches. Tags: Multi-stem, Specimen Collection, specimen tree, Zelkova Serrata.